What is the Gospel, The Kingdom? EXTRA! SOVIETS PROPOSE NONAGGRESSION PACT! Is It a SIN to Have INSURANCE? Why should there be so much confusion about what man IS? What happens to a human at death? Does death separate an immortal soul from the body? Read the startling proof, answering these questions that have perplexed millions. THE ONLY sure thing about life, they say, is death and taxes. That's a common saying — at least in America. To the average man on the street, death is a vague, far-off, unreal something that always happens to someone else — a hazy, cloudy, and distant possibility he feels he can worry about when it happens. In the United States, when the average citizen reads of the predictions of the National Safety Council concerning some four hundred persons who are to die on our congested highways, he cannot bring himself to believe one of those 400 persons could be he! And yet, true to the stark and tragic toll of lives that are lost every "holiday" in our nation, about the number predicted to die lose their lives in automobile accidents. What is this thing called life, and (what seems more important to most) death? There are literally dozens of differing ideas about what happens at death. To many people, it is a fearsome departure into some "other world," from which there can be no return. Most professing Christians believe death to be merely separation of the soul from the body — with the conscious individual living on. Death, they reason, is not really death at all — but continuation of life under different circumstances, and in a different "body." Amid all this confusion surrounding one of the most important questions of your life, you hear various churches argue that human beings have only two places to go after death — heaven or hell. One large church teaches there are three places: heaven, purgatory and hell. Others understand there is only one place — the grave — and that a resurrection is needed to impart eternal life to human beings. But what about all these differing ideas? Why is there such confusion even among all the churches? Have they ever seen a "soul" go flitting off to heaven or hell? Has anyone ever been there, and returned to tell us humans of his experiences? Take, for an example, the modern innovation in medicine of "heart massage" as a last-minute emergency mea sure to preserve human life. The patient has died! The doctor, bending over the still corpse to examine it with his stethoscope, pronounces the body dead. Hurriedly, last minute preparations are made, and the body is opened. The doctor begins to massage the heart of the dead person — forcing the blood to begin to flow once more. After several minutes, a weak, pulsating "fluttering" of the heart muscles is felt. Gradually, a regular, steady pulse develops, and the heart of the dead person begins to beat. The corpse is not a "dead" person any longer — the heart is functioning once more! This is not some farfetched idea — but a general description of some actual cases that have occurred. What happens to man at death? All those who have "died," and then been restored to life by heart massage, say they had no conscious knowledge of anything during the time they were "dead." death? And if the conscious "you" leaves the body immediately at death, why is it that not one of the persons can member one single thing during the time they were "dead"? you would be able to think and know while you are unconscious, or in such a condition already described? Since the "soul" is not something that can be found by laboratory testing, or by the methods of science, and since even the religionists have mixed-up, differing ideas about the "soul," and since no soul has ever returned to tell us where it had been — then where is the only source of knowledge? How can we ever find the answer to this perplexing problem? There is only one source! That source is the revelation of the Almighty Creator who made us, and therefore He should be the One who knows the answer, shouldn't He? But — that revelation does not reveal what most of us have assumed, or have been taught to believe! Where did all these differing, confused ideas come from? Why do the churches teach that you have an immortal soul? Does the Bible teach it? Did Christ indicate it? Did the early apostles or the New Testament Church believe it? Why does the Bible continually emphasize the resurrection of the dead? Would a resurrection be necessary if you continue to live apart from your body? Most people do not realize what a man really is, believe it or not. Yet God plainly tells us the answer. "And the Eternal God formed man of the dust of the ground, and breathed into his nostrils the breath of life; and man became a living soul" (Gen. 2:7). There is the answer! Man became a living soul; that is what man is — a soul. Notice there is no mention that man has a soul, but that man is a soul. When God placed Adam and Eve, who were two living souls, in the garden, He issued a command: "And the Eternal God commanded the man, saying, Of every tree of the garden thou mayest freely eat: But of the tree of the knowledge of good and evil, thou shalt not eat of it: for in the day that thou eatest thereof thou shalt surely die." God was speaking to the man, who was a soul! When God said Adam would surely die for taking of the wrong fruit, He was directly informing man of the penalty for sin. The inspired Apostle Paul wrote, "For the wages of sin is death; but the gift of God is eternal life through Jesus Christ our Lord" (Rom. 6:23). Death is the absence of life, the cessation of life — not the continuation of life under different circumstances. Notice the two opposite states given in Romans 6:23. God tells us the wages of sin is death, but, on the other hand, the gift of God (not something you were born with) is eternal life through Jesus Christ. If eternal life is the gift of God, and comes only through Christ, how is it that humans have assumed they already possess eternal life in the form of an "immortal soul"? Ezekiel said the "soul" that sinneth shall die! Since man is a soul, and since man can die, and a soul can die, it is obvious that man and soul are one and the same thing! When God breathed the breath that imparted life into the first man, he became a living soul (Genesis 2:7). The Hebrew word in this scripture for soul is nephesh. Nephesh can mean "a breathing creature, i.e., animal or vitality" and is also rendered in the English as "appetite, beast, body, breath, creature... man, mind, mortally." Open your Bible to Genesis the first chapter and the 24th verse. "And God said, Let the earth bring forth the living creature [nephesh] after his kind, cattle, and creeping thing, and beast of the earth after his kind: and it was so." Here the word "creature" is the identical Hebrew word that is used throughout the entire Old Testament for "soul." Read verses 21 and 24. Here, the same word, nephesh, is again translated "creature" in the English. Insufficient space does not permit the reproduction of every single verse where this word nephesh is used, but for a few other references, see Genesis 2:19; 9:10, 12, 15 and 16. Here the word nephesh is used in every case, and is always translated "creature." Nephesh is used in many places where the revisers have supplied our English word "body." Turn next to Leviticus 21:ll. "Neither shall he go in to any dead body [nephesh], nor defile himself...." A nephesh is called a "body') in this scripture! In Numbers 6:6; 9:6, 7, 10 and 19:13 you can find identical renderings, where the Hebrew word nephesh is translated into English as "dead body." These scriptures are plain, clear and absolutely conclusive evidence that the same word rendered "soul" can refer to a "dead body." It is with a gasp of surprise that many people turn to their Bibles and find that most of the traditions and the assumptions of men just are not there. How about you? Are you willing to change your ideas when you can see them disproved, not from the vain "ideas" of men, but from the plain, clear, inspired Word of God? When God breathed into Adam's nostrils the breath of life, He started the process of the combining of oxygen with the blood, which then carried the oxygen to all parts of the body, thereby imparting physical, animal life. The life of a human being is in his bloodstream. A wounded soldier on the battlefield fights to stop the flow of blood from his wounds, knowing that the loss of blood means the loss of life. The same is true in every case of wounds causing bleeding. You already know, and have known most of your life, that the loss of blood causes death — just as the Bible says. Then why have you blindly assumed differently about the vague, hazy, nebulous ideas on the "immortality" of the soul? God told Noah the life of any animal, or nephesh, was in the blood. "But flesh with the life [Hebrew, nephesh] thereof, which is the blood thereof, shall ye not eat" (Gen. 9:4). Here, the word "life" comes from the same Hebrew word nephesh, which is elsewhere rendered "soul," or "body." Read on, in verse five, where the same word is used for our English word "life," this time in reference to Naoh and every man. The life of man and the life of animals is the same. Mortal life! "For the life of the flesh is in the blood...he shall even pour out the blood thereof, and cover it with dust. For it is the life [nephesh] of all flesh; the blood of it is for the life thereof: therefore I said unto the children of Israel, Ye shall eat the blood of no manner of flesh: for the life of all flesh is the blood thereof" (Lev. 17:11-14). In these verses the English word "life" comes from the Hebrew word nephesh, and is defined in these biblical verses to be the life (blood) of all flesh, including all animal life as well as humans. Moses gave the Israelites God's warning about eating flesh with the blood still in it, "for the blood is the life [nephesh]; and thu mayest not eat the life with the flesh" (Deut. 12:23). The soul of man, therefore, is kept alive by the coursing of the blood through his veins, taking life-giving oxygen to the body cells. There are many other biblical references where the word "life" is directly connected with the blood, and is rendered from nephesh. See Genesis 19:17, 19; 32:30; 44:30 with Exodus 4:19 and 21:23, 30. Remember, you have already seen amply proved that the life, or the soul, of any animal or human consists in the life-giving blood in the body. For another amazing proof, turn to Isaiah the 53rd chapter. In this prophecy concerning the coming of the promised Messiah to die for the world, God shows it was the soul of Christ that was given for us. "Yet it pleased the Eternal to bruise him; he hath put him to grief: when thou shalt make his soul [nephesh] an offering for sin..." (Isa. 53:10). How did Christ die? Any casual student of the Bible knows it was His shed blood that caused His death, not the sentimental "idea" of humans that Jesus died of a broken heart! (Write for our free reprint article "Did Christ Die of a BROKEN HEART?") Isaiah 52:14 describes the horrible beating Christ took when He was scourged before being forced to drag His own cross to the place of the skull. (See Matthew 27:26 and I Peter 1:19.) Jesus died because of the loss of His life-blood. It was His blood that was "shed" (Matt. 26:28), and "poured out," "...Because he hath poured out his soul [nephesh] unto death: and he was numbered with the transgressors; and he bare the sin of many, and made intercession for the transgressors" (Isa. 53:12). Jesus Christ died because He bled to death — yet your Bible expressly states it was His soul that was poured out! Of course! The "soul" is the physical, temporary life of the human body, which can die (Ezek. 18:4, 20), be cut off (Exodus 31:14), and sent to the grave (Psalm 30:3). Nephesh is the word generally translated "soul" in the King James Version of the Old Testament. Nephesh — in reference to human beings — is always speaking of the temporary, physical, animal life which is supplied by the transfer of oxygen through the blood. As Hebrew scholar Marvin Pope states: "The term (nepes) has a wide range of meaning including breath, life, appetite, emotion, and the whole person. The idea of the soul as a separate entity from the body is unbiblical" (Job, Anchor Bible, p. 195). Since the idea of the immortality of the soul didn't come from the Old Testament, which comprised the only inspired Scripture existing until long after the time of Christ, then where did the idea come from? The Jewish Encyclopedia says: "The belief that the soul continues its existence after the dissolution of the body is...speculation ...nowhere expressly taught in Holy Scripture....The belief in the immortality of the soul came to the Jews from contact with Greek thought and chiefly through the philosophy of Plato, its principal exponent, who was led to it through Orphic and Eleusinian mysteries in which Babylonian and Egyptian views were strangely blended" (article, "Immortality of the Soul," vol. VI, pp. 564, 566). It came from the pagan Greeks, and was introduced into an apostate, paganized "Christianity" nearly two centuries after Christ! The Greeks obtained it from the Egyptians, who taught it soon after the apostasy at the tower of Babel. ACROPOLIS — Center of ancient Greek religious influence, devoted mainly to the sanctuaries of the patron gods. different periods of time adopted as their own" (Euterpe chapter 123). Socrates, a famous Greek philosopher, taught the pagan error to Plato. Compare the present-day teachings of the churches with what Plato wrote in his book, the Phaedo: "The soul whose inseparable of life's opposite, be immortal, and Do we believe there is such a thing as death? To be sure. And is this anything but the separation of the soul and body? And being dead is the attainment of this separation, when the soul exists in herself and separate from the body, and the body is parted from the soul. That is death....Death is merely the separation of the soul and body." Plato, the student of Socrates, teach death was really death to the common Rather, he taught it as a separation of the "soul" from the body. But have you wondered why some of t erroneous ideas were taught? PLATO (c. 428-348 B.C.) — Famous student of Socrates, Plato taught that death is the separation of body and soul. CICERO (106-43 B.C.) — Roman author, orator and statesman who adhered to the "double-doctrine" method of teaching. inconstant, filled with irregular desires, precipitate in their passions and prone to violence; there is no way to restrain them, but by the dread of things unseen, and by the pageantry of terrifying fiction. The ancients therefore acted not absurdly, nor without good reason, when they invented the notion concerning the gods and the belief of infernal punishments" (Book VI, 55,56, Hampton's translation). This is pretty plain, isn't it? Polybius was wise enough to know that the pagan doctrines of hell and the heathen gods were plain fiction. However, he thought that such teaching was a good thing so that the passions of the masses could be bridled and that the state could function properly. But, as he states, the educated leaders knew the whole teaching was a myth. We have the records of many learned men of ancient Greece and Rome who plainly knew that the doctrine about the immortality of the soul was a falsehood. They were invented to deceive the common people into a type of obedience to the state. "Cicero, Seneca, Panaetius, Polybius, Quintus Scaevola (The Pontifex Maximus [High Priest]), and Varro regarded religion as a device of states men to control the masses by mystery and terror" (James Hastings, Dictionary of Religion & Ethics, vol. 7,p. 61). Pagan religion and all its ramifications were simply manufactured to control the masses. The doctrines of a hell immediately after death — which signified that people had inherent immortality — were meant to scare the common people into being faithful citizens. Philosophers, theologians and statesmen developed what became known by the first century B.C. as the "double doctrine" or the "double-truth" teaching. This "double-truth" doctrine was manifested principally through the mystery religions. Those few who were initiated into the highest degree of the mysteries were told the truth regarding the immortality of the soul, Hades, etc. They were told that the common doctrines were lies, but beneficently given to control the people. This "double truth" doctrine is mentioned in the Dictionary of Religion & Ethics (vol. 7, p. 63) as "one truth for the intellectual classes and one for the common people, the climax reached is the phrase, 'It is expedient for the state [the people] to be deceived.' "
The populace were told one thing and the intellectuals (actually those initiated into the mysteries, as we will see), were told the naked truth. The leaders would not tell the people the facts which they were very much aware of. The Dictionary of Religion & Ethics shows how these men made jests about the credulity of the common people in accepting their teachings. "Cicero was an augur [a Roman religious official] yet he quotes with approval Cato's saying that he wondered how one augur could meet another without laughing" (ibid., p. 63). "The latter-day philosophies of Greece proved to the Roman that the foundations of his religion were baseless, yet its existence was indispensable for the preservation of the state. This conflict between private belief and public conduct can be seen, for example, in Ennius. He wrote treatises, embodying advanced skeptical doctrines, and he also wrote patriotic poems in which the whole cycle of Roman gods was exhibited and most reverently treated" (ibid.). Ennius used the familiar double-doctrine method of teaching. One of the most important observations to be made regarding the teachings of the pagan philosophers and/or theologians is that they all adhered to the "double-doc trine" method of teaching. Pythagoras in the sixth century B.C., Plato, Aristotle, and even those of the first century, always had two doctrines! Invariably, their disciples were told the truth (as much as the philosophers understood), and the common people were told as many fables as was necessary to control them and render them governable. "He divided his disciples into two classes, the one he called esoteric, the other, the exoteric. For to those [the first] he trusted the more perfect and sublime doctrines, to these [the latter] the more popular and vulgar" (On Philosophy). PYTHAGORAS (c. 570-490 B.C.) — Greek philosopher soul is immortal and undergoes a series of incarnations, both human and animal. doctrine teaching — it was simply the common thing to do (ibid., p. 444). "As we sometimes cure the body with unwholesome remedies, when such as are most wholesome have no effect; so we restrain those minds [of the common people] by false relations, which will not be persuaded by the truth. There is a necessity therefore of instilling the dread of those foreign torments" (World Life). "Plato declares that animals have constantly a soul [i.e., all animal beings, including man, have an soul], which serves to animate and inform their b as for stones, wood, and what we commonly call inanimate parts of the creation, all he says, are quite destitute us, where he explains his and select friends, he there gives up the common notion, declares that there is a soul dif fused through the universe, which is to actuate and pervade every part. Now we are not to imagine that in this case he is tent with himself, or maintains contrary doctrines, any more than Aristotle and Theophrastus are to be charged with contradiction, when they declared to their disciples their real doctrines and to the common people, principles of another nature" (On the Natural Faculties). All these philosophers told fables to the general population, but they told the truth (the truth that they lied to the people) to their own disciples. Notice how Galen says that Plato told the masses about the immortality of the soul, but to his real friends he rightly said that one universal spirit pervaded the universe to give life to all. There was nothing about the immortality of the soul told to the latter group. It is as clear as it can be that Plato himself did not really believe such nonsense, even though he taught it to the laymen. Listen to Strabo, who knew what Plato really taught. He is speaking about the religious doctrines of the Indians. "They invent fables also, after the manner of Plato, on the immortality of the soul, and on the punishments in Hades and other things of this kind" (Book XV, chapter 1, 57, Bohn translation). Read Plato's bold admission: "As for the symbol on the private note, you desire to know my serious letters and which contain my real sentiments from those letters that do not, know and remember that (the word) God [i.e., God — singular] begins a serious letter, and the word gods [i.e., gods — plural] begins one that is otherwise" (Epistle 13). It is well known that Plato's teachings on the immortality of the soul and about the punishments in Hades were his exoteric teaching — meant for public consumption. It was clearly a fable. But, strangely enough, Plato and the other philosophers felt no wrong in teaching such things. They thought that lies were necessary! We are told by Synesius, a thorough-going Platonist, "that philosophy, when it has attained the truth, allows the use of lies and fictions" (Synesius, Epistle 15). These are well-known facts. Lies and fictions were regularly employed by the ancient philosophers. The ancient pagans believed that the people, especially in the realm of religion, needed to be deceived. They felt it was expedient for the State. Even the Roman Pontifex Maximus (High Priest) Scaevola frankly declared "that Societies should be deceived in religion" (Augustine, City of God, Book IV, chapter 10). "Varro, speaking of religions, says plainly that there are many truths which it is not expedient the common people should know, and that many falsehoods which yet it is useful for the people to receive as truths." (ibid.). There can be no doubt that Pythagoras, Plato, Aristotle and the rest taught lies about the immortality of the soul, and that they laughed among themselves at the doctrine of punishment in Hades immediately after death. These people knew better. Medieval concept of hell shows sinners doomed to writhe eternally upside down in burning potholes. The dead of such infernal punishments and foreign torments was anciently instilled in the common people in order to make them more governable. "It is very true, that Plato in his writing inculcates the doctrine of a future state of rewards and punishments: but this, always in the gross sense of the populace: that the souls of ill men descended into asses and swine [by virtue of their immortality); that the uninitiated lay in mire and filth; that there were three judges of hell and talks much of Styx, Cocytus, Acheron, etc." and all so seriously, as shows that he had a mind to be believed. But did he indeed believe these fables; we may be assured he did not" (Divine Legation, vol. 1, p. 452). 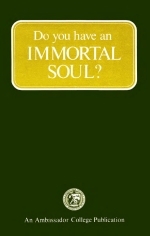 Did you assume the doctrine of the immortality of the soul came straight from the Bible? Did you believe that such a doctrine which most of us have been reared to believe was the true doctrine of God's own revelation? Instead of following the revelation of Jesus Christ, some early church leaders followed the teachings of the pagans. Toward the close of the second century, a school of professing Christians in Alexandria, adopted Platonism plus Bible as Egypt, the their creed. One of their chief teachers, Origen, wrote: "Souls are immortal." He continues to speak of "The Platonist, who believes in the soul" (The Ante-Nicene immortality of the Fathers, vol. IV, pp. 314, 402). Notice, this teaching came from Plato, not the Bible! Tertullian, another important teacher at the close of the second century, wrote: "For some things are known, even by nature: the immortality of the soul, for instance, is held by many ... I may use, therefore, the opinion of a Plato, when he declares: 'Every soul is immortal'" (vol. III, p. 547). "In these our days...the sower of tares, the ancient enemy of the human race, has dared to sow and foster in the field of the Lord certain very pernicious errors, always rejected by the faithful, especially as to the nature of the reasonable soul (animarationalis), that it is mortal; or one and the same in all men; and some, rashly philosophizing, declare this to be true, at least according to philosophy. Desiring to employ remedies appropriate to such a plague, we, with the approbation of the sacred council, condemn and reprobate all those who assert that the intellectual soul (animintellectiva) is mortal" (Mansi, Concilia, XXXII, Coll. 842, from The Radical Refomation by G. H. Williams). During the Reformation, instead of returning to the "faith once delivered," most continued in the same pagan errors that had been perpetuated by the ideas of men. Martin Luther's futile efforts to eradicate the immortal soul concept were soon forgotten by the Protestant movement. Matthew 10:28 Many ask about the meaning of Matthew 10:28. This verse reads, "And fear mot them which kill the body, but are not able to kill the soul: but rather fear him which is able to destroy both soul and body in hell." This verse is directly stating that even though one man may kill another, the killer cannot cause the ultimate destruction of life. Mortal men can destroy human life, but God has ordained that everyone is going to be resurrected 10 life (John 5:28·29). God alone is the ultimate Judge and reserves to life if He deems it Himself the right to absolutely extinguish necessary in any given case. The meaning of Matthew 10:28 is clouded because the word "soul" has lost its true meaning in religious circles. Actually "soul" simply means "life." Once this meaning is understood, Jesus' statement becomes clear. The English word "soul" IS translated from the Greek word psuche and the Hebrew word nephesh. both of which mean a living, breathing creature, when referring to man or animal. "Soul" NEVER means something immortal in man or animal. It simply pertains to the fife of all physical creatures. In Leviticus 17:11 the word translated "life" comes from the same Hebrew word for "soul" and can be just as accurately translated, "For the soul of the flesh is in the blood." Jesus gave his life (translated from the same Greek word meaning "soul"] a ransom for us (Mark 10:45) by pouring out His soul (life's blood) in payment for sin (Isa. 53: 12). "Soul;" then, refers to the physical life in man or animals. The soul is something that can be destroyed. Ezekiel twice said:" The soul that sinneth, it shall die" (Ezek. 18:4, 20). God can destroy the physical body and the. soul or life Luke quotes Jesus as saying: "But I will forewarn you whom ye shall fear: Fear him, which after he hath killed hath power to cast into hell [the lake of fire — the final second death]. "(Luke 12:5). God allows man the power to take physical life. But that only causes a temporary cessation of life — the first death (Heb. 9:27). God has the power to resurrect and, if He then judges a person-unworthy to be in His Kingdom, the condemned will be thrown into — the lake of fire to be utterly consumed. This is the second death from which there will be no-resurrection (Lev. 20:14·15; Mal. 4:1). The-body and the (soul) of the incorrigibly wicked will be destroyed forever by the fire of Gehenna (hell). The following free booklets will clear up other common questions on this subject: After Death... then What?, Is There A Real Hell Fire? Luther's original teachings have never ceased to embarrass Protestant theologians who have accepted the teachings of ancient Egypt and Greece. The Protestant reformers found the people unwilling to change their doctrines. Gradually, the reformers themselves gave in to popular tradition — tradition which has its roots in pagan philosophy and speculation. And so most churchgoers today believe the doctrine of the immortality of the soul simply because they have unquestioningly embraced the speculations which have been passed down from ancient pagan philosophers. The Apostle Paul wrote about this very kind of speculation: "Beware lest any man spoil you through philosophy and vain deceit, after the tradition of men, after the rudiments of the world, and not after Christ" (Col.2:8). The Bible is NOT the source of the common belief in the immortality of the soul. It plainly teaches that man is mortal — physical — fleshly — of the dust. Let's look at what Jesus Christ actually said. What Did Christ Actually Teach? Many are firmly convinced Jesus must have taught the immortality of the soul, because they have heard that He actually taught this doctrine. Let's find out what the Bible says. When Jesus sent out His disciples on a training mission during His ministry, He gave them instructions for their journey. He knew they would come in contact with men who hated the truth, who would even try to kill some of them. Because of this, He said, "And fear not them which kill the body, but are not able to kill the soul: but rather fear him which is able to destroy both soul and body in hell" (Matt. 10:28). Christ said very plainly the "soul" (Greek — psuche) can be destroyed by a fire! Souls Under the Alta WHAT are the "souls under the altar" mentioned in Revelation 6:9-11? Some claim these verses prove the immortality of the soul. But the Bible itself proves that souls are mortal by nature, and that the entire description is symbolic. John was "in the spirit" (Rev. 4:2) during the entire duration of the opening of the Seven Seals. The events John saw in spirit were not happening! They were to happen "hereafter" (Rev. 4:1) . What did John see? He saw in vision a book, or scroll, which Jesus began to open (Rev. 5:5). As each seal was revealed, John saw a heavenly enactment of what was to take place on earth. As Christ came to the Fifth Seal, John "saw under the altar the souls of them that were slain." The biblical interpretation of these Seven Seals is given in Matthew 24. The Fifth Seal is symbolic of the tribulation (Matt. 24:9-28). The tribulation came on the saints of God in type, during the Middle Ages, and it will come yet again. The souls that "were slain" were told to "rest yet for a little season, until their fellows wants also and their brethren that should be killed as they were, should be fulfilled" (Rev. 6:9, 11). The souls crying "Avenge our blood" are analogous to Abel's blood "crying unto God from the ground" (Gen. 4:10). Blood doesn't talk! The representation is obviously not literal, but symbolic. The "souls under the altar" are merely a symbolic representation of the martyrdom of saints. Just as the blood of the bullock in Old Testament sacrifices was poured under the altar (Lev. 4:7), so these saints appear to John to be under the altar. Just as the prayers of saints are compared to incense brought to a heavenly altar (Rev. 5:8; 8:3), so the prayers of these martyred saints come up to God's altar, in symbolic vision. These saints who have died in Christ are not in heaven, on earth, in limbo, purgatory, or any other animated state. They are "asleep" in their graves, awaiting the resurrection at Christ's coming (I Thess. 4:15-17). At that time, they will "reign on the earth" (Rev. 5:10; 20:4). "immortal" soul. Rather, He said, "...but if you will enter into life, keep the commandments" (Matt. 19:17). The "golden text" of the Bible is another proof "For God so loved the world that he gave his only begotten Son, that whosoever believeth in him should not perish, but [on the other hand] have everlasting life" (John 3:16). Even this most-often-quoted scripture of the Bible shows that Jesus Christ came that humans would not perish, and that they might, on the other hand, enter into everlasting life. Christ told a group of people when they told Him of the dead Galileans, "I tell you, Nay: but, except you repent, you shall all likewise perish" (Luke 13:3-5). Most professing Christians believe the basis for the doctrine of the "immortality" of the soul is found in Christ's parable of Lazarus and the rich man. But, most do not realize what the Bible actually says about this parable. You will see that the beggar and the rich man BOTH DIED (Luke 16:22). Space does not permit a full, detailed explanation of this parable here. If you have not yet read the amazing booklet Is There A Real Hell Fire? Some astounding questions would be precipitated if the pagan doctrine of the immortal soul were true. Why, if the "soul" immediately departs to go to its "heavenly reward" at death, did Jesus Christ resurrect His beloved friend Lazarus? Why, if the whole purpose of Jesus Christ was to save our souls, did He call Lazarus back into the frail, human body, when he had been experiencing "heavenly bliss" for four whole days? (John 11.) Does this make sense? Is it logical? Jesus did not teach any such doctrine of the "immortality of the soul" at all! Rather, He taught that the "soul" would perish unless it repented, and He showed that God had the power to burn it up in Gehenna fire, which is the second death. The major teaching of the early New Testament Church centered around Jesus Christ — and His resurrection from the dead! Paul, in His inspired letter to the Corinthians, explained: "Now if Christ be preached that he rose from the dead, how say some among you that there is no resurrection of the dead? But if there be no resurrection of the dead, then is Christ not risen: and if Christ be not risen, then is our preaching vain" (I Cor. 15:12-14). But — why would a resurrection of the body be needed, if the soul were already in heaven? The answer is simple — the entire New Testament proves it — the soul does not go to heaven — it dies, and goes to the grave. The only real hope of a Christian, as taught by the original inspired Church, was to attain to the resurrection. They knew and understood the only way to attain eternal life was through a resurrection from the dead. "That I may know him, and the power of his resurrection, and the fellowship of his sufferings, being made conformable unto his death; if by any means I might attain unto the resurrection of the dead" (Phil. 3:10-11). Paul repeatedly explained this great mystery, and preached it unceasingly to the Gentile Christians of his day. Paul said, "Christ died for our sins" (I Cor. 15:3), and went on to explain, in the entire fifteenth chapter of First Corinthians, that the dead must be raised, or else our entire faith is vain (verses 16-17); that the physical man is earthy (verse 47); and that a change via a resurrection is necessary before we may have eternal life (verse 52). On the day of Pentecost, when the Church was built, God inspired the Apostle Peter to say, "Men and brethren, let me freely speak unto you of the patriarch David, that he is both dead and buried, and his sepulchre is with us unto this day" (Acts 2:29). Peter went on to say, "For David is not ascended into the heavens.. ." (verse 34). Did you notice it? David, a man after God's own heart (Acts 13:22), was not up in heaven! Are Souls Reincarnated? REINCARNATION embodies the belief that after death a person's "soul" takes up residence in an animal, insect, or another human being. This process is sometimes referred to as the "transmigration of the soul" or "metempsychosis." The belief in reincarnation manifests itself in many forms and variations, especially among Oriental and primitive tribal religions. Certain African tribes even believe that displaced souls can inhabit trees. In certain parts of Asia, it is believed that the soul goes into crops; hence funeral arrangements are made to accommodate the agricultural year. Some believe that the soul leaves the body through the nostrils or the mouth and is embodied in a person's breath. The forms of animal life eligible to receive a departed soul are many and varied. Birds, butterflies, weasels, cows, dogs, snakes, sharks, mice, wood boring wasps, dung beetles, alligators, and many other life forms are thought to be soul-bearing receptacles. Perhaps the most prominent and complex system of beliefs in reincarnation is found in the Hindu religion. "In later Hindu ism, metempsychosis [reincarnation] reached a monstrous development. . . it was believed that there were 8,400,000 forms of existence through which all souls were liable to pass before returning to their source in the Deity" (Encyclopedia Britannica, XI Edition, article "Metempsychosis"). The idea of reincarnation is certainly not of recent origin. The ancient Egyptians felt that a certain privileged few had the option after death of choosing what life form they wished to reside in. The Greek philosopher Plato was also an advocate of the immortal soul concept. He taught that the number of souls was fixed and that birth simply meant the migration of a pre-existing soul into the new-born body. But how do these "pre-existing" souls keep up with the population explosion? Since the number of people on the earth today is far greater than it has ever been, where do all the extra souls come from to fill the growing number of bodies? And what about the billions of insects and animals that have lived and died? Much more significant is the fact that reincarnation does not square with God's Word. Reincarnation is based on the doctrine of the immortality of the soul. If souls aren't immortal, then they can't migrate from place to place. And the Bible plainly shows this to be the case. Notice Genesis 3:19: "In the sweat of thy face shalt thou eat bread, till thou return unto the ground; for out of it wast thou taken: for dust thou art. and unto dust [not another's body] shalt thou return. " Also Ecclesiastes 3:19, 20: "For that which befalleth the sons of men befalleth beasts; even one thing befalleth them: as the one dieth, so dieth the other; yea, they have all one breath; so that a man hath no preeminence above a beast. . . . All go unto one place; all are of the dust, and all turn to dust again." Psalm 146:4 states that when a man dies, "His breath goeth forth, he returneth to his earth; in that very day his thoughts perish. This booklet explains in greater detail the real nature of man and why he does not possess an immortal soul that lives on or "migrates" after death. Of course! Jesus Christ also tells us, "And no man hath ascended up to heaven, but he that came down from heaven, even the Son of man which is in heaven" (John 3:13). What About "Soul" in the New Testament? But didn't the New Testament apostles talk of "saving human souls," some will ask. For example, we read that in the opening days of the true Church "...they that gladly received his word were baptized: and the same day there were added unto them about three thousand souls" (Acts 2:41). These "souls" are spoken of as having repented and come into the Church. But remember, your Savior said souls can be destroyed. Then what is the answer? The simple truth is that "soul" is merely an English expression which means "persons" or "lives." The Greek of the New Testament proves it. Believe it or not, there is not one single expression in the entire New Testament of your Bible where the word "soul" — in reference to human beings — can have anything whatsoever to do with immortality, eternal life, extra-physical life, or anything other than mortal, temporary life. "Soul," in the Greek, comes from psuche, which means "life, breath of life, and earthly life." It corresponds to the Hebrew nephesh, which often means the temporary life of animals. This is evident both from its use in the Septuagint version of the Old Testament and from pas sages in the New Testament which we will now examine. The word psuche is used for the lower animals twice, exactly as the Hebrew nephesh can mean the life of lower animals. Two scriptures for reference are found in Revelation 8:9 and 16:3, where the word is rendered "life," and "soul," with reference to the life of lower animals. Sprit and Soul and Body I Thessalonians 5:23 reads: "And the very God of peace sanctify you wholly; and I pray God your whole spirit and soul and body be preserved blame less unto the coming of our Lord Jesus Christ." Some claim this verse proves the "immortality of the soul." But does it? Let's understand this expression "spirit and soul and body." Paul here referred to the MIND in man when he used the word "spirit," to the PHYSICAL LIFE when he used the word "soul" (see Revelation 8:9 where the same Greek word rendered "soul" in I Thessalonians 5:23 is translated "life," referring to sea life, and Revelation 16:3 where it is translated "soul" but refers again to natural physical sea life), and to the FLESH when he used the word "body." Paul was exhorting the Christians in Thessalonica to have their whole minds, lives and bodies pre served blameless — preserved from the penalty of sin — in anticipation of the coming of Christ. (See also II Corinthians 7:1). The Bible plainly reveals man is MORTAL, corruptible flesh — organic matter with a temporary life. He has no eternal life inherent within himself — no "immortal soul." He is a physical, fleshly creature destined to die and turn to dust and remain that way -except for the intervention of the Almighty. But God has sent His Son to make it possible for us to receive the GIFT of immortality and eternal life at the resurrection from the dead. Psuche is used of man as an individual (just as we speak of a ship going down with every soul on board, or of so many lives being lost in a railway accident), and appears 14 times in the New Testament as "soul." Psuche, used of the life of man, which can be lost, destroyed, saved, laid down and so on, occurs 58 times, and is rendered "life" and "soul" interchangeably. Every year thousands lose their lives in automobile accidents. What happens to them after death? Are their souls still living? Does life continue at some other unspecified location? Greek words, we can see there is not one single place in the entire Bible where "soul" has anything to do with the immortality of human beings. Satan the devil, the great deceiver, who has succeeded in blanketing the whole world in false doctrines such as this (Rev. 12:9), has not always used the same beliefs to deceive. At this present time, most men believe in his fable of the immortality of the soul. Therefore, it is easy for him to have his demons and evil spirits masquerade as the "departed souls" of human beings. Many people have actually seen or heard extra-physical and supernatural manifestations which have been responsible for perpetuating this pagan doctrine even further. Satan wished to deceive anyone by means of a supposed "calling back from the grave," he used the entire body in the form of an apparition, not just a voice or rap ping which is supposed to represent the departed spirit. Solomon knew that man died exactly as did the beast: "For that which befalleth the sons of men befalleth beasts; even one thing befalleth them: as the one dieth, so dieth the other: yea, they all have one breath; so that a man hath no preeminence above a beast: for all is vanity" (Eccl. 3:19). Did you read that with your own eyes, in your own Bible? Your Bible says the death of a man is just like the death of a dog or a cat! "All go unto one place: all are of the dust, and all turn to dust again" (Eccl. 3:20). David, under inspiration of God's Spirit, said the same thing: "Put not your trust in...the son of man, in whom there is no help. His breath goeth forth, he returneth to his earth; in that very day his thoughts perish" (Ps. 146:3-4). The consciousness perishes — not continues to exist in a different place. "For the living know that they shall die: but the dead know not anything" (Eccl. 9:5). But you have assumed people in heaven can hear the shrieks of the tortured people dancing, leaping, writhing in supreme agonies in hell, haven't you? Where did you ever read any such thing in the Bible? If you have not yet read our free booklet Is There A Real Hell Fire?, which explains this false concept thoroughly, then do so immediately. Now did Jesus ever say anything about a hell fire? To be sure! But Jesus did not describe a place where the wicked are tortured forever and ever. Let's notice what He did say. "And these shall go away into everlasting punishment: But the righteous into life eternal" (Matt. 25:46). Notice Jesus' words. He said the wicked would receive eternal punishment, not eternal punishing, and there is a great difference. The "wages of sin is death" (Rom. 6:23), and that death, which is the absence of life, is for all eternity. It is eternal punishment by remaining dead for all eternity — not remaining alive and being tortured in a fictitious burning hell fire. Remember Jesus' warning to fear Him who has power to destroy the soul in Gehenna fire (Matt. 10:28). The Prophet Malachi gives us a description of this fire when he says, "For behold, the day cometh, that shall burn as an oven; and all the proud, yea, and all that do wickedly, shall be stubble: and the day that cometh shall burn them up, saith the Lord of hosts, that it shall leave them neither root nor branch" (Mal. 4:1). Notice! They are to be burnt up, totally consumed in the fire — not tortured by some kind of fire that never burns. "And ye [speaking to the righteous] shall tread down the wicked; for they shall be ashes under the soles of your feet in the day that I shall do this, saith the Lord of hosts" (Mal.4:3). There! So you see now? The wicked will be consumed, and their remains will be just the ashes and vapors left from the fire that burns them up. They will be dead, for all eternity. Is Man Merely an Animal? Since man does not have an immortal soul, does this mean he only has animal existence? There is a spiritual element which makes man uniquely different from the animals. Let's understand an amazing truth. The Hebrew words of Genesis 1:26-27 reveal God's great plan and ultimate purpose for mankind. When God molded Adam of the dust, he was shaped in the "likeness" -the outward form and shape — of God Himself. God didn't form any of the other creatures to be an exact replica of Himself. This unique form and shape was given to man alone. God intended for man — to whom He gave the gift of a thinking, reasoning mind — to develop the very mind and character of God. Each animal was created with a brain suited for its place in the balanced ecological system of the earth. But animals do not have the potential of mind and character which God gave only to man. No animal was ever given the gift of mind power. It is this very special attribute of mind and character that separates men from the animals. Animals do not have reasoning, self-conscious minds. Animals follow instinctive habit patterns in their feeding, nesting, migration and reproduction. God has "programmed" their brains, so to speak, with particular instinctive aptitudes. Thus beavers build dams, birds build nests, etc. These aptitudes are inherited — they are not the result of logical cognitive processes. But man is vastly different. Man is able to perceive and understand various ways to perform an act. Man can reason from memorized facts and knowledge, draw conclusions, make decisions, and act according to a thought out plan. Man can also choose — he has free moral agency. Man can originate ideas and evaluate scientific knowledge because he has a mind which is patterned after God's own mind. Man can devise, plan, and bring his plans to fruition because he has been given some of the very creative powers of God! Man alone can wonder, "Why was I born? What is life? What is death? Is there a purpose in human existence?" Man, unlike the animals, not only "knows" how to do certain things, but he also knows — that is, he is aware -that he has "knowledge." He is self-conscious, aware of his own existence as a unique being. Many animals have physical brains as large, or even larger than man's brain, and with similar complexities of structure — anatomically, chemically, electrically — but none has the power of intellect, logic, self-consciousness and creativity. What gives man these unique abilities? And what will God use, after the death and complete dissolution of the physical body and brain, to reproduce each individual at the resurrection? The Bible speaks of a "spirit IN man" (I Cor. 2:9-14; Job 32:8, Zech. 12:1). This spirit is not the man — it is something that is in the man. Joined with the physical brain (matter) of the man, it forms human mind. It imparts to man's brain his unique powers of intellect and personality — the ability to think rationally and make free-will decisions. It imparts the ability to learn mathematics or a language — any type of knowledge relating to the physical realm. However, the spirit that is in man has no consciousness of itself. It is not an "immortal soul." The spirit is not the "man." Because of this spiritual element, the Bible often uses the word "spirit" simply to mean man's mind, intelligence, attitude. And it is apparently from the pattern locked up in this "spirit" (comparable to a "tape recording") that God, at the resurrection, will recreate each individual with exactly the same mind, personality and general appearance he had at death. At death, the spirit in man "tape" is complete — it contains, at that time, every nuance of life, thought, personality and character which made us just exactly the singular individual we were. The "tape" can then be "filed" — until needed again for reactivation in the resurrection. Solomon, whose writings decimate the immortal soul fantasy, alludes to this "filing": "Then [at death] shall the dust [the human being] return to the earth as it was, and the spirit [the spirit-in-man tape] shall return unto God who gave it" (Eccl. 12:7). We have clearly seen that the Bible does not teach the immortality of the soul. But what, then, does the Bible teach about immortality? Let's notice how the Bible uses the word "immortality." Your Bible tells you that only God has immortality. "Who only hath immortality, dwelling in the light which no man can approach unto; whom no man hath seen, nor can see: to whom be honour and power everlasting" (I Tim. 6:16). The word "immortality" is used only in five places in the Bible: Romans 2:7; I Corinthians 15:53, 54; I Timothy 6:16; II Timothy 1:10. Study those scriptures. In each case, immortality is something that is brought to light, that must be obtained, that God only has, and in no case is something man already possesses. The entire message of the New Testament surrounds being born into that world-ruling family by a resurrection from the dead. Jesus Christ was resurrected from the dead, and said the time is coming when all the dead are to be resurrected. But, if man has an immortal soul in a material body -and if the death of the body released the soul — then there would be no need for a resurrection to immortal life. Man would merely continue living after death. But the very fact that the Bible teaches the resurrection from the dead is further proof man has no immortal soul. The pagan ideas of men, perpetrated by Satan, the arch-deceiver of the world, have kept men blinded to the overawing glory that awaits every true believer. God's plan is being fulfilled with every passing day. His plan is to ultimately give as His free gift eternal life to mortal, sinning human beings — after they have repented of their sins and begun to keep His laws. "Verily, verily, I say unto you, The hour is coming, and now is, when the DEAD shall hear the voice of the Son of God: and they that hear shall live. For as the Father hath life in himself; so hath he given to the Son to have life in himself.. . Marvel not at this: for the hour is coming, in the which all that are in the graves [not in heaven or hell] shall hear his voice, and shall come forth; they that have done good, unto the resurrection of life, and they that have done evil, unto the resurrection of damnation" (John 5:25-29). "Our friend Lazarus sleepeth; but I go, that I may awake him out of sleep. Then said his disciples, Lord, if he sleep, he shall do well. Howbeit Jesus spoke of his death: but they thought that he had spoken of taking of rest in sleep. Then said Jesus unto them plainly, Lazarus is dead" (John 11:11-14). "And many of them that sleep in the dust of the earth shall awake" (Dan. 12:2). "And the graves were opened; and many bodies of the saints which slept arose" (Matt. 27:52). "And when thy days be fulfilled," said God to David, "thou shalt sleep with thy fathers.. ." (II Sam. 7:12). Death is described as a sleep dozens of times in the Bible when referring to the kings of Israel and Judah. "David slept with his fathers..." (I Kings 2:10). Notice that it does not say "the body slept while the soul was conscious." It plainly says, "David slept." It was the conscious person who fell "asleep" in death. Here is further evidence that the dead are not conscious — that they have no conscious "immortal souls." You do not have an immortal soul! You are physical, fleshly, susceptible to death. The only way to live for all eternity is to repent, or else you will finally perish (Luke 13:3). The decision is yours — and it will be a decision for all eternity. May God grant you will make the right choice.